Do You Want Your Friends GUSHING Over Your Stunning Refinished Wooden Floors, Without Spending A Fortune On A Professional? As a homeowner faced with the task of bringing your wood floors back to life, it can be a very difficult decision whether or not fork out the money and hire a professional or roll up your sleeves and DO IT YOURSELF! Is it going to look good enough when you’re done? How can you be certain that you aren’t going to ruin your floors and end up REPLACING THE WHOLE LOT? The decision can paralyze you! …to do an absolutely fantastic job, by anyones standards. Pareto’s Principle states that roughly 80% of the effects come from 20% of the causes. I can verify, that rule remains true here. You see, resanding and refinishing isn’t just about improving the floor. It’s about changing one’s entire house, an ascension on the family lifestyle ladder. Hiring A Pro May Not Guarantee You A Good Finish! I have seen some of my competitors consistently produce worse work than any DIY job I have seen. Luckily very few pro’s are like this, but how can you know whether the guy you’re hiring is the right one? 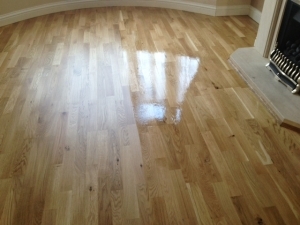 Did you know that resanding creates more attractive hardwood floors than new installations could ever hope to achieve? I should know, I did both types of jobs for 10 years. Though more than 95% were resands and refinishes, because it was so much more sensible for the homeowner. Given time to settle, older wood just looks better after being sanded, smoothed, and finished with a nice coat of lacquer. These days the flooring you buy comes from fast-grow farms where nature doesn’t have the time to produce the stunning grains you find with older flooring. In terms of quality, hardness, and durability, older wood also has the upper hand. The difference comes down to how the trees were grown. Back when we still had substantial forest land, wood mills would chop down 80-year-old trees that were slow grown, and had a durability to them that you don’t see anymore. Nowadays those same wood-harvested trees are grown through genetically modified seeds, taking years instead of decades to reach maturity. That fast growth speed shows in the lackluster wood that they produce. Yes, when you’re replacing the plumbing and electrics, best to call an expert. But your floors? This isn’t rocket science my friend! With just a couple hundred dollars for equipment rental, more for the materials, and an honest desire to do something meaningful with your hands, I guarantee you could do this job better than any expert. It’s your home, and no one cares about your house as much as you do. Frankly when you’re paying a fixed-price job, people want to get it done quick and get paid. Not an issue at all when you do it yourself. Average job price my crew charged? $4,500 for a resand/refinish. And even that looks cheap compared to the $12,000 average my installer buddy charged for fresh installs. These figures assume your run-of-the-mill, three bedroom, two bath house. 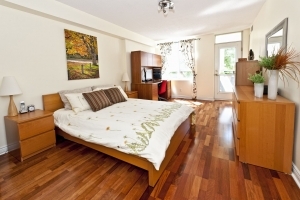 Expect to pay proportionally more for extra rooms. This is exactly why you don’t see real estate agents recommending upgrading the floors prior to a sale – it’s so darn expensive it’s not worth it! But when you do it yourself, all that extra cash go straight into your pocket. Even if you don’t sell, the cash is still accessible to you. Next time you’re looking to refinance some money, your appraiser is going to give you a higher price for the upgrade due to the improvement. In my low-cost guide, I’m going to walk you through the entire process of sanding a floor. We go from the very basics prep stages all the way to putting the finishing touches on the floor to give it that extra “wow” factor that woos guests and family members alike. 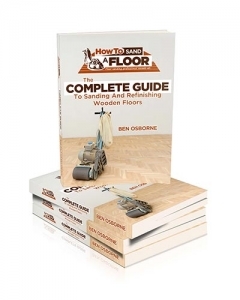 In the sanding section of my guide, you’re going to learn the basics of how to use a good-quality floor sander. No, you don’t need to buy one, they can be cheaply rented at any local hardware store that does rentals. You can call in advance to find them, they’re everywhere. Once you’ve gotten the heavy duty sanding work out of the way, I’ll show you how to fill all the gaps before moving on to finishing sanding, which will prime the floor for a beautiful coat of lacquer. Lacquering is what gives the traditional wooden floor a modern upscale look. And to go one step further, I’m going to teach you some other techniques that involve staining and even colored finishes to really take your floor to the next level. Wives especially tend to love this step because of the vast array of look and style options available for them to choose (hopefully with your input as well!). No matter what type of wooden floor you have, my guide covers it. There’s many types of woods out there, and they absolutely do need to be treated slightly differently. You’re going to get that information when you pick up my guide. I have taken 2 courses with the major manufacturers in the industry. These courses were being taught by people who rarely (if ever) actually sand floors themselves. professional floor refinishers like me encounter every day. So how much do I charge for giving away my craft… My Trade Secrets? This eBook is normally valued at $97 . Which I think you will agree is incredible value, for all the benefits you’ll receive. A perfectly smooth, flat finish, a pocket full of cash and most of all, astonished friends and family. Considering I actually do this every day (and thus, know what I am talking about), I could charge a lot more! 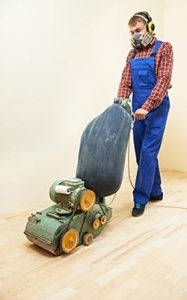 You can make a lot of money sanding and refinishing floors… and $2500 is reasonable to buy your way into a new career! It’s an investment. You’re going to raise the value of your home in a big way. Not by throwing money at it, but by putting some good old-fashioned work into it! Save $50-$100 right from the get-go. Most people who start a resanding/refinishing job don’t have a plan in place before they put down good money to rent the equipment. It’s no surprise they spent more in rental fees than they need to. Use the carefully laid out action plan in my guide to shave a day or two off your project, and save yourself the cost of my book several times over! Or your money back!! I’ve been in this business for a long time and know what makes people fall in love with their new floors. As my promise to you, my guide will teach you the same techniques I’ve used to help you achieve those same stunning results in your own home while saving money. 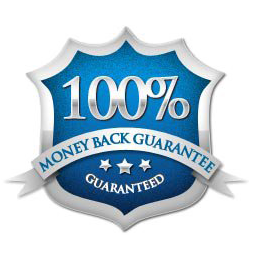 My Triple Moneyback Guarantee: Please accept my 100% moneyback guarantee as good faith that I stand behind my word. If I fail to deliver on this promises of an excellent floor for your home AND saving time and money. Even if you just don’t like my accent! Get in contact to request your money back in full – no questions asked. As a professional floor refinisher for almost a decade, I can tell you that new homeowners are always wowed by the end result of a resanded and refinished floor. Admittedly they were less impressed by my bill, but us floor refinishers have to make money, and we sure charge for it! On the other hand, you can save yourself over $4,000 (on average) and have a great home improvement project on your hands with this easy-to-follow $37 book. If you been thinking about it, give it a try. 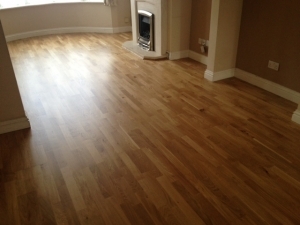 You got nothing to lose, and a beautiful new polished wood floor to enjoy! PPS: The cost of an extra day’s rental equipment will run you $50 to $100 per day. My comprehensive resanding/refinishing guide easily helps you shave 1 to 2 days or more off your sanding project. That means you’ll save money and get a better outcome in the process – a total no-brainer. Do your project the smart way — pick up my guide today to learn how!